Bartel, C. 2013. Establishing a framework for trade policy in South Sudan. GREAT Insights, Volume 2, Issue 8. November 2013. Maastricht: ECDPM. Newly independent post-conflict South Sudan still has a long way to go even just to reach the starting line of the liberalisation race. Although it has only just celebrated its second Independence Day, the Republic of South Sudan is already deeply enmeshed in international trade flows. As a post-conflict, oil-dependent, land-locked LDC, South Sudan depends on imports for virtually all manufactured goods and much of its food. It finances its engagement with neighbouring exporters through a combination of oil exports and foreign aid, making it arguably a deeply “globalised” economy already. What South Sudan lacks, however, is the capacity to implement its 2012-2014 Strategic Policy Framework and put in place a modern trade policy regime, starting with the very basics: an actual tariff structure. Rather than paying tariffs, imports pay across-the-board taxes through a regime that is not articulated with the country’s development goals, and riddled with tax-exemptions granted to politically favoured importing firms. Little thought is given to protecting sensitive products, or to easing the flow of imports essential to development. South Sudan’s nascent state structures and embryonic private sectors are ill prepared to serve as launching pads for a liberalising agenda as enormous institutional gaps remain. Even to discuss a liberalising agenda in this context is to miss the mark: the predominant form that liberalisation and regional integration negotiations take in Sub-Saharan Africa surround the question of tariff abatement. But in South Sudan, there is no tariff structure to serve as a starting point for such talks, highlighting the scale of the preliminary challenges the country must face. In fact, the most prominent factors holding back the country have little to do with tariffs. Key non-tariff concerns include the lack of access to financing; weak road, air, and river transport infrastructure, unpredictable bureaucratic procedures, and weak administrative capacities. The absence of a modern trade regime is just one more symptom of the precarious capability of state institutions in the new country. In South Sudan, much of the bureaucracy of statehood that is taken for granted even in the poorest (but longer-established) African countries is simply missing. In that context, calls to establish a tariff structure must compete with policy-makers’ attention with a host of other urgent concerns, many of which will strike them as more directly relevant to people’s well-being. South Sudan’s priorities for post-conflict economic growth centres on building resilience to economic and environmental shocks. Adverse weather and a difficult security situation leave many of its people facing acute livelihood insecurity, with around half the population classed as food insecure. Creating the rudiments of a financial sector and a private enterprise development system. These concerns have tended to dominate policy-makers’ agendas in the early post-independence period, to some effect. The new government has managed to put in place policies that have led to a booming financial sector, aided by a favourable official exchange rate administered by banks. The number of banks has gone from 2 to 18 in just four years. More than 10 other banks are lining up to open branches in the country. Juba has seen the number of airlines landing at its airport rise from 2 to 11 airlines, with daily direct connections to its neighbouring countries, North Africa, and the Middle East with easy connections to the rest of the world. Nonetheless, major constraints remain. Infrastructure remains among Sub-Saharan Africa’s poorest, with cities, towns and villages routinely cut off from the outside world as rainy-season downpours make the roads impassable. An ongoing insurgency in Jonglei state and tensions at different spots of the Northern border keep security a primary concern. An on-again-off-again threat from Khartoum to close off oil exports renders the country vulnerable to major external shocks, such as the impasse that kept most oil exports shut-down throughout 2012. In this context, it is perhaps not so surprising that calls for trade regime modernisation struggle to rise to the top of the political agenda. Notwithstanding the many other challenges faced, a modern tariff structure should inform the next steps of South Sudan’s development strategy. While such a structure must take cognisance of the need for a more open economy able to attract foreign capital inflows and also imports, it must reflect the post-conflict country’s desire to join the East African Community (EAC) and eventually become part of a regional market and customs union. Without a baseline tariff structure, the country is not able to quantify its benefits and losses from bilateral, regional or international trade. 1. The appropriate level of protection based on the country’s level of economic and trade development. 2. Membership of implications of joining the EAC, Common Market for Eastern and Southern Africa (COMESA) and implications of the envisaged customs union, being mindful of the pitfalls of multiple memberships in regional economic communities (RECs) especially now that it needs to improve its non-oil trade balance that currently is in favour of, and dominated by, its regional trading partners. 3. Ongoing multilateral negotiations, which have emphasised reduction in average tariff, rates without taking into consideration the peak rates prevailing in some of countries. In line with the longstanding – though recently weakened – consensus in the multilateral system, South Sudan must be mindful to designate specific agricultural tariff lines as Special Products, preferably identifying those lines through indicators for food security, livelihood security and rural development. When negotiations for the agreement on agriculture and industrial tariffs are relaunched in the near future, South Sudan should at least be in a position to take its seat at the negotiating table. A tariff structure is the basic tool that will enable it to do so. Properly implemented, a modern tariff structure can serve not only as a baseline for liberalisation but also as a development tool: modernising production, increasing value addition and enabling the growth of key sectors. The government of South Sudan derives nearly 98% of its budget revenues from oil. 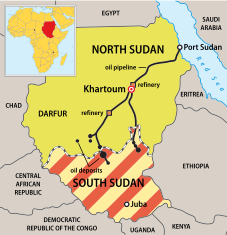 The shutdown of oil pipelines due to a political dispute with Sudan had a devastating social impact and impact on formal-sector GDP, which declined by at least 55% in 2012. The 2012 crisis sparked a broad recognition of the need to diversify the economy. The question, therefore, is whether and how South Sudan can overcome Dutch Disease and diversify its economic base in an era of increasingly open trade. The Government made it a priority to focus on the development of non-oil sectors to achieve long-term sustainable growth. An aggressive trade facilitation agenda is under discussion, including major infrastructure projects such as the Lamu Port Southern Sudan-Ethiopia Transport (LAPSSET) pipeline-road-and-rail link with Kenya’s northern Lamu Port, as well as projects to create ‘One Stop Border Posts’ (OSBPs) to establish efficient and transparent customs administration. Together, such initiatives could significantly contribute to economic dynamism that shifts the government’s fiscal base away from purely oil-based revenues. The Government of South Sudan already operates a single point of contact for all business transactions in South Sudan. Investors are in contact with a single entity in a streamlined and coordinated process. Company registration and incorporation takes 24 hours. Since independence over 19,816 businesses have been registered in South Sudan. Although institution building continues to lag, Parliament has already acted to give a legal basis to many of the institutions needed. It passed one of the few comprehensive tax laws in Africa: the investor-friendly Taxation Act of 2009. The act provides a sound tax policy framework; a strong basis for tax administration, and a modern, easily administered tax law given its low and simple rate structure. Business profit tax is 10% on small and 15% on medium- sized businesses. Yet, for all its positive features, this tax structure cannot supplant a properly thought-out system of trade tariffs. For many small businesses in South Sudan, however, the key barrier to growth has less to do with laws and public policies and more to do with financial constraints. Even though it is well understood that small and medium-sized enterprises (SMEs) carry out 90% of economic activity, many still have difficulty securing financing because they have few assets to offer as collateral for loans from traditional debt-based financial intermediaries, such as banks. Equity markets have typically failed to bridge the gap and provide badly needed capital to small firms. Yet the preponderant barrier to SMEs development is the lack of skilled personnel, rather than a shortage of funds. Banks require well-formulated and sound business proposals, but few SMEs are in a position to formulate them. Moreover, newly registered SMEs lack a track record, making it hard for new financial institutions to assess their creditworthiness. It is important to bridge the skills gap through more than just primary education. A skills agenda must look to on-the-job training, mentoring and exposure to different environments as key elements in helping create an entrepreneurial class. Close supervision of management to overcome both informational asymmetries and moral hazard. There is a need to target incentives that support tapping into the expertise of international firms and experts. Such sources of expertise can help ease the skills, production and financing shortages and assist local producers and service providers to upgrade products and services. The pillars for private sector development are slowly taking shape in South Sudan amid one of the world’s most challenging environments. These include a policy framework that facilitates an enabling environment to build investor confidence, ensure a level playing field, low administrative barriers, and good economic governance. Policy development has focused on contract law, company law, investment authority, sector-specific laws working closely with Ministry of Legal Affairs and building capacities to manage government procurement procedures. 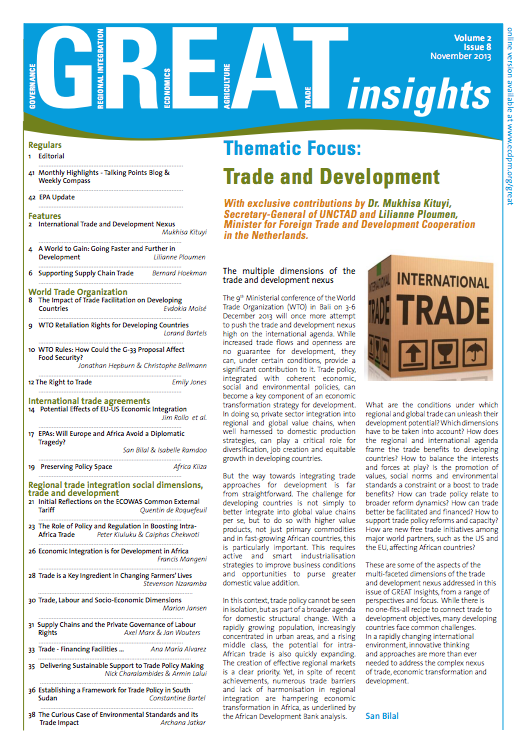 The development of a modern framework for Trade Policy Making is just one aspect of this much broader institutional and capacity development agenda, and understandably often fails to garner sustained attention from top-level policy-makers. The basic initial need is the establishment of a coherent, modern tariff structure that eases imports of key products, protects sectors sensitive to development. In parallel, an agenda to tackle non-tariff barriers to trade, especially in infrastructure and access to finance, must be vigorously pursued. These two sets of issues should serve as the basis for a liberalisation agenda in South Sudan. Constantine Bartel is CEO of InvestSouth, the Investment Gateway to South Sudan.